Below are a series of charts, excerpted from RSMeans construction cost data, our go-to source on construction cost information. All graph images are courtesy of RSMeans Construction Cost Data. Data source: Reed Construction Data – RSMeans/Charts: Reed Construction Data – CanaData. For the most common office building size, two to four stories tall, the range is from just over $140 per square foot in Winston-Salem to over $240 per square foot in New York – Note that this is over $10 per square foot more than last year. The spread here is largely due to the local cost of labor and regulations that allow various construction types that are allowed in low rise construction. For example, in some cases where wood frame construction is still allowed, depending on location and occupancy, this would help to keep costs lower. In areas that are restricted to non-flammable construction, price per square foot will go up. By taking advantage of savings provided by vertical construction, you will see approximately a 4% savings in cost per square foot by increasing the stories to between five and ten stories. While one might expect a larger savings for that economy of scale, several new requirements come with the mid-rise building that are often not dealt with on the low rise buildings. For example, elevator shafts and service corridors get more complicated as well as HVAC systems. The geographic spread in cost per square foot is identical to the low-rise data and the increase from last year is approximately $6-$11 per square foot depending on region. This is still principally driven by local factors such as labor costs and local regulatory requirements. Finally, the high rise buildings see the most economic cost per square foot. For buildings between eleven and twenty stories tall, there is approximately an 11% savings over the mid rise buildings and 15% over low rise. this is largely due to the fact that similar elevator, HVAC and service equipment requirements are required for mid and high rise, resulting in more economy of scale for going up. The data for this year indicates a $15-$30 per square foot or approximately 13% increase in construction cost over last year, depending on region. Note that over twenty stories starts getting into more unique building characteristics that will drive costs in various ways. For more information on estimating the cost of your office building during the early planning stages, contact any of us here at EVstudio and we can help scope the right size project for your pro forma. Thanks Bobby – that adds a bit more clarity. With the existing building being a fair amount larger than assumed in my ballpark, you’ll just have to apply those same metrics to what you have, but note that there are likely (hopefully) elements of the existing building you may not have to strip down to minimums if they’re not stacked below the new levels. So while the estimate would have a higher total, your cost/sq.ft. of the existing floors not under the new floors would have a further discount to reflect that. How much would be quite a guess without having as-builts of the existing building and understanding at a conceptual or schematic level how the new floors will impact the lower floor plans, engineering systems, etc.. Hopefully though, this is enough to help you get the ball rolling. Best of luck with the project! Wow, that’s a lot more than just a back of the envelope calculation! The current building is 3 above grade stories of ~11,500 sq feet each. Building is on a corner with a 5 story building on one side and an empty yard (not owned by me) on the other side. I was just using 7500 sq ft per floor for the addition so that the new addition does not go the adjacent lot lines so I can get some natural light on all 4 sides of the building. With current zoning, NYC is allowing me to build 5x the footprint. 5 story building next door is already built to maximum size. Empty lot on other side of the building is owned by a deep pocketed national firm that purchased the lot and an adjacent office (former factory) building 5 years ago and I would guess will be developing it in the next 5-10 years (lot and ground floor are currently leased to the former owners of the lot/office bldg). Hi Bobby, thanks for your question. Not as easy to ascertain an answer without knowing a lot more about the existing building conditions, but let’s break it down into the simplest terms. New finished Office space in NYC was running between $233 and $243 in 2012 for the mixed height between what you have now (3 stories) and what you will be going to (6 stories). Conservatively using $243, we’d need to escalate to 2018 numbers. While I don’t have localized data for your specific location, the national average for escalation has been .75% per quarter or 3% per year. So the escalation would be 1.03^6 to get to 2018, or pretty close to 20%. Note some areas have escalated costs more and some less than this, but for a “back of the envelope” study, this will have to do. So, a 20% escalation to $244 is $292.8 (round to $293). Now, that number would be for a finished building, and you are shooting for a “white box” level of finish, so there would be a reductive effect if this were an entirely new building. However, because it’s not an entirely new building, there will be substantial additional costs to the existing space for structural, mechanical, electrical and plumbing systems. In fact, I would imagine that your HVAC, electrical and plumbing will be all new for the existing building as it would be hard to imagine any existing systems can support the new square footage. Additionally, the surgery required for the vertical circulation for egress could be substantial. You described extending a freight elevator, and you will need an elevator for people as well, preferably two. While the structure may be able to support the additional loads (which should certainly have to be validated), there’s no doubt going to be additional structural work for reinforcing, bracing, etc..
Of the myriad of ways to analyze this, the simplest might be to take the new space at a discounted rate and the existing space at an adjusted discounted rate. For tenant finish in NYC, I would expect between $70 and $100/sq.ft. For average level of finish (note class A+ space would be much higher than this, but the RSMeans data is not for class A+ space). So let’s say a round $220/sq.ft. would be budgeted for the new space to get you a white box condition. The existing space is reusing the structural skeleton, floors, columns, beams, exterior skin, but little else. Let’s say that plus the site infrastructure is worth $100/sq.ft.. so a white box condition for that space would then be in round numbers, $120/sq.ft.. Assuming the existing three stories is the same footprint as the new space (a little over 7,000 sq.ft. each floor), then we’d have the existing three stories at 22,000x$120 plus the new three stories at 22,000x$220, for a total conceptual starting budget of approximately $7.5M. Note these numbers do not include land basis, finance costs, brokers fees, soft costs, environmental costs, FF&E, or contingency. And also note that the budget would have to be re-assessed after a full existing building analysis was done and the new addition fully programmed, preferably with an initial concept plan to outline the basis of design. I hope that helps. It sounds like a great project and hopefully this discussion enables you to proceed with your next steps. I’m interested in adding a total of 22000 sq feet on top of an existing 1920’s era 3 story brick/steel building in the borough of Queens in NYC. I would go 3 stories, so a little over 7000 sq feet per story. My now retired structural engineer said the building could support it. Looking at pretty much bare white box space, 11 ft ceilings with a men’s and a ladies room on each floor. Any help with what the per square foot cost for such a vertical addition project? On top of that cost, I’d be replacing an existing basement to third floor 8’x8′ freight elevator at a cost of at least $125k? Or would 2 elevators be more typical? 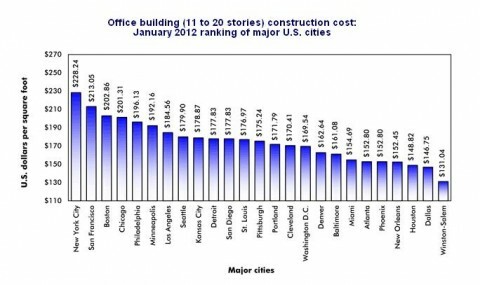 Adjusting up for indexed increase in construction costs, Houston falls at approximately $215/sq.ft. for average mid-rise multifamily housing. From the averages, we would expect $75-$95 of that would be the interior finish for a typical building (obviously, that can be all over the map depending on the product – but this would be average). So the core and shell would then be somewhere in the neighborhood of $120-$140/sq.ft..
We do have an office in Texas and have provided our clients with value added A/E design that results in great performing buildings that meet the budget all over the country. If you would like to discuss your project further – we’d be happy to set up a meeting and explore the next steps. We can be reached through this blog, or at 303-670-7242 or design@evstudio.com. Thanks! Thanks for your question. I would anticipate a 2 story Type VB mixed use commercial building in Castle Rock to run approximately $130-$150/sq.ft. for the core and shell. Not so long ago, it used to be closer to $110/sq.ft., but escalations have been among the highest ever. For TI, I would typically budget $40-$60 for office or retail and closer to $60-$90 for MOB, but there’s a lot of factors that would influence that – specific type of medical – dentistry, urgent care, Laboratory space, etc..
We are headquartered in Denver and would be happy to meet to discuss your program in more detail so you can zero in a bit closer to your budget. We specialize in mixed use commercial and with our in-house integrated A/E team, can help you hit your budget targets while also getting a great building. Let me know if you are interested and when you are available and we can set something up. I’m looking at building a mixed use, 2 story commercial building in Castle Rock with retail on the main floor and office above. 4500 s.f. per plate, 9000 total, Type VB construction. My question is how much to budget (roughly) for core and shell construction costs per s.f, then TI for retail, TI for Medical, TI for Office? Only vertical costs, all site devel, land, consultant, finance and soft costs are not included. With escalations for rising construction costs, you can expect this type of project to run between $215 and $245 per square foot depending on a variety of factors. So that would be between $600k and $690k for a finished 2,800 sq.ft. building. These numbers are for the building only and exclusive of FF&E, soft costs, finance costs, land basis and site development costs. The site costs are really a function of the site conditions, existing utilities, required grading, on site detention, road access and required site improvements the AHJ may require. In general, if you are starting with a developed pad site, your site development costs (parking, driveway, sidewalks, utilities, etc.) might easily run another $90k-$120k. There are of course many variables to consider in preliminary cost estimating, so once you have a conceptual plan, the scope and costs can come much more into focus. We are happy to help you with your project and can provide full Architectural and Engineering design in one shop. Soft costs for Architecture, Structural, Mechanical, Electrical and Plumbing Engineering services typically run 5%-8% of the construction cost. Civil Engineering would be based on the site conditions and the requirements set forth by the authority having jurisdiction. I will reach out to you separately by email and we can continue the discussion and help you take the next steps. Also, can you break it down into shell and parking costs and then interior finish out costs. One small kitchen/breakroom area and 3 commercial restrooms. I am working on a ground up design build dental office. Approx 2800 square feet with 5 operatories, fairly basic. I have located the land and need to put some numbers together. What would a turn key cost range be for single story, masonry exterior, with parking lot for about 32 cars. This is in the Dallas, TX area. Also, what are your architecture and engineering fees to draw this up? You bet Kevin. A budget of $20/sq.ft. Would get you some upgrades, but definitely not a full makeover. You might get some minor interior wall reconfiguration, but the bulk of that budget will largely be new flooring, paint, hardware and maybe some light fixtures. We’re happy to help. For budgeting purposes, we typically tell clients to plan on 5%-8% of estimated construction costs for soft costs until we have an opportunity to fully scope the project – at which point, we can define a fixed fee for the scope of services. Our interiors team can provide just about any level of service you desire, so once you have decided on a direction, let us know and we can arrange to discuss the next steps. Thanks! Many thanks for sharing that info. I am looking @ more of the remodel budget with regards to the rehab. Basically want it to look like a fresh modern new office in side. Exterior, windows, roof, hvac are fine. Currently very nice inside but 90’s nice. Plush maroon carpet, red walls, lots of brass fixtures etc. Baths are similarly dated.. Does have nice crown molding throughout and 9′ ceilings.Mainly new commercial grade carpet square, full paint job, remodel of 4 bath, remodel of the kitchen and perhaps some minor relaying out of the floor plan. It currently set up a single tenant use with a lot of wasted space. When you walk in you are in a grand open front desk type area that probably takes up about 400SF. That is the concentric core of the layout with a hallway going all the way around it to the other parts of the building. I envision changing the layout to 2 users and essentially splitting it in half. So there will be some slight wall modifications likely. I had budgeted around $20/sf for this but it sounds like I shot too low based on your intel. What would a ballpark fee be from you guys for designing such a rehab? Kevin, thanks for your question. Sight unseen, it would be difficult to assess what stays and what goes…will the exterior facade be replaced? Windows and doors? All flooring and ceilings? Bathroom finishes and fixtures? What about 20+ year ole mechanical systems – are they in need of replacement? Replacing light fixtures too? How is the condition of the structure? New roof too? As you can see, there are many variables. If you were to strip the building completely down to the studs and replace everything, you could be looking at $90-$120/sq.ft.. Considering scraping it and building new would be $180-$240/sq.ft. (Depending on many factors of course), there’s no doubt value in the existing structure provided the gross floor area and configuration of the space is functional. But I’m guessing you’re not planning to be that aggressive with the renovation. A healthy remodel budget to update older buildings without changing HVAC systems or exterior skin or fenestration is typically $40-$60/sq.ft.. That’s a healthy enough budget you can really transform a space. We design a lot of older commercial building renovations and understand the process of the onion peel nature of these projects in a way that yields decisions that give you the most impact for your dollar. Best of luck with your project and let me know how else we can help! I am in the process of purchasing a 1.5 story designed office building in the Midwestern STL region. 4500SF on main and about 200 SF above. Do you have a rough ballpark idea of what it would cost per SF to “modernize” the building. It is totally function as it sits but has a very 90’s dated fell/look/flow. I think it would be minimal wall relocations and mostly aesthetic updates with perhaps some layout changes as well. Lastly, would you have a ballpark price per SF to construct this from scratch? other points of info, it is a frame building with brick for the most part with eifs cladding on portions. tall ceilings, 9′ throughout 1st floor. on slab. Thanks for your question. In your area, you can expect a core and shell single story masonry building to run between $90-&120/sq.ft.. the tenant finish out inside would then run $40-$80/sq.ft., depending on user, finish, amenity, etc.. those are typical ranges of course and other factors could influence those numbers up or down. These numbers are for “sticks and bricks” only, so do not include soft costs, site costs (including utilities), finance costs, or FF&E. I hope that helps. EVstudio has significant experience with office warehouse space and can help you with a fully integrated A/E design to meet your budget. We also have an office in Texas that serves the Dallas area. Let me know if you would like to discuss the project further and we can get you the resources you need to move forward. Give us a call at 303-670-7242 or email design@evstudio.com. Thanks! Hi Dean – thank you so much for the information. We will certainly keep you in mind for architectural services. Those RSMeans numbers are for a finished building with “average” finishes. Not boutique luxury nor bottom of the barrel, but what you would typically expect to find for office space in that market. However, please note that the published RSMeans data in the article is from 2012. To calculate today’s current cost per square foot, you need to find the construction cost index for your area and simply multiply the $165.36 by that index number to get a budget starting point. Several published indexes are out there – I’ve used the index that Mortensen publishes in the past. If you search for construction cost index online, you’ll find several and you’ll have to filter by location and project type. If you are looking for design services, please keep us in mind. We offer full service A/E design across the country and have a group that specializes in office buildings. We take budgets very seriously, and as such, is the #1 design parameter. When the design team has both Architects and Engineers under the same roof, you would be amazed at how we can achieve great results for lower construction costs. We are looking at building a 3 story office building in Fort Lauderdale, FL (parking on ground floor, 1.5 floors of office space and .5 floors of storage (our own storage instead of the 10,000/sf of offsite storage currently utilized). Each floor is 20,000 sf, so we would end up with 30,000 sf of office space and 10,000 sf of storage. The storage will be later converted to offices when we acquire more parking (neighboring parcel is likely to build something grand in the future or we’ll make an arrangement for extra parking from another neighboring property). We will utilize 15,000 sf for our own operations and lease out the other 15,000 sf. The costs in Miami (near to us) in your article suggests 165.36/sf. Is this the cost for a finished building (including interior walls, finishes, etc.) or essentially the building with an interior shell? If just a shell, do you have the approx. cost/sf for Class A and Class B interiors? Thank you for your reply Dean. This one is not so easy to answer. The RSMeans construction cost data in this particular study is ideally suited for new construction projects. RSMeans does publish unit pricing for a wide variety of trades, and it is available on their website for a fee. It is very specific, because projects like this are always very unique. Without a full set of as-built documents along with a set of design documents, it would be very difficult, if not impossible to give you any kind of rational target you can depend on. I would highly suggest you engage a local contractor to walk through the project and discuss your objectives. They should at least be able to give you a general ballpark of what to expect. Best of luck with your project and if you are in need of any design assistance on the architecture or engineering side, please let us know! Looking for help with factoring in construction costs on a 4 story office building in downtown Boston that is on the Historic Registry. The front facade of the building would have to conform to historic standards if it were damaged. Insurance company asking for a “construction cost appraisal” taking the historic requirements into account. Any info. Or direction on a how to find a qualified appraiser who could do this would be appreciated!! Thanks for your question. There are no doubt some unknowns with your project, such as number of stories, construction type, level of finish, and lot characteristics. But in general, for a project like you have described in your location, I would expect anywhere from $170-$210 per square foot for a finished new construction building. So, $1.6M-$2M would be a starting range for the building construction budget given the 9600 sq.ft. building described. This of course would not include land costs, finance costs, site improvement costs, soft costs and FF&E costs. Having personally designed several physical therapy spaces, there is a wide spectrum of the kinds of things to accommodate depending on the services provided and the clientele. If you need any design assistance with your project, let us know and we can leverage our extensive experience to help you save a lot of money and coordination headaches with our integrated architecture and engineering team. combined with 5600 sf anytime fitness center? Joseph, thanks for your reply. 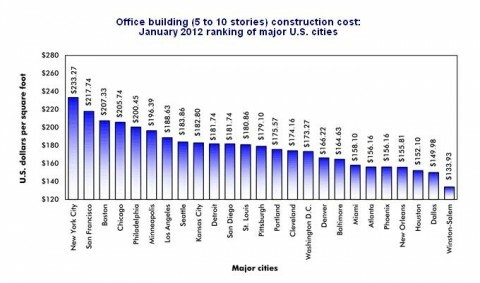 Another link that you may find of interest has construction costs for other project types, including restaurants is: http://evstudio.com/cost-per-square-foot-of-commercial-construction-by-region/. KY isn’t represented in these charts, but it can be interpolated by other similar cities in the region. The bigger question is: what portion, if any, will be finished out and at what level will the finishes be? These charts all show finished buildings. So you would need to plan for a core and shell budget exclusive of a tenant finish budget. So, if the entire building will be core and shell, with the exterior complete, MEP systems in, site work complete, and ready for tenant finish, you would be looking at the ballpark of $90-$120 per square foot. Then, the tenant finish costs would be in the neighborhood of $30-$60 per square foot. Obviously, there are many variables that affect these ranges from the complexity and construction type of the building to the level of finish. But these would be a good starting point for a pre-concept pro forma. We have designed many projects like this and would be happy to work with you on your project. Please let us know how we can help! I am helping a client with preliminary budgets for a 4 unit commercial space of 10,500sf in Lexington, KY. One unit will be a 3,000sf restaurant. The equipment will be omitted from the costs because the Owner already has, and will be installing their own restaurant equipment. The other unit will be a warehouse type for storage at 2,500sf. The final 2 units will be just shell construction for future tenant fit-up. Thanks for your question. Our regional Director in Austin, Don Eckols, will be reaching out to you shortly to discuss your project further and help you move forward. Dean, We are looking to build 2450 sft single floor office space in Austin area, Is it possible to get estimation on shell and also complete building cost. And also need some contacts who can help us in the process of building the space. Thanks for your inquiry. Based on your location and the fact that the project would be all Union, I believe the range you would be looking at would be $200-$220 per square foot as a budget starting point. Of course, a great many factors would play into that, not the least of which would be level of finish and design complexity, but that’s a good place to start for a median. If you would like to discuss your project in more detail, we have a team of experts in office building design that have worked on projects across the country. If we can be a resource to you, please just let us know. Thanks! My company is doing a pricing exercise for our development in Weymouth MA, 5 stories high, all union construction. I don’t have an actual square footage number. I was curious to what the cost per square foot would be. we already own the land so it is all construction costs that I’m looking for. Thank you for your question. That is a fairly small size for an office building, which puts upwards pressure on the price per square foot. While the chart would suggest a cost in the neighborhood of $160 per square foot, the small square footage could easily push you up into the $200 per square-foot range. The level of finish, and program could heavily influence that – I am assuming the building does not share basic services like restrooms or kitchenette functions with other buildings nearby. If you budgeted for the high 100s, that should give you some room to work with a typical office building level of finish. But if you are thinking of a high-end boutique office space, you could easily go much higher. We have a team of experts who have done hundreds of thousands of square feet of office design, so if you would like to speak with us regarding architecture or engineering services, we would be happy to discuss it with you. This sounds like a great project – very near our Denver office and right up our alley. Are you seeking architecture and engineering design services? 2- 6100 sf buildings on 41,000 sf rough building site in Westminster Colorado. Shell only. Future tenant finish to be 1200 sf tenant space in each building price separately. 12′ exterior walls, bar joist roof with 2″ insulation and single ply membrane roof. Exterior walls to be: Rear stucco with 12′ EFIS cornice, sides and front to be combination of tile 4′ waynes coat, brick, stucco and storefront glass w/ wall hung painted metal canopies at tenant storefronts. Include 5 – 5 ton RTU’s each building, electrical switch gear, gas service, plumbing rough under (10″ leave out slab). Sitework to include parking lighting, asphalt parking, concrete curb, gutter, sidewalks, and landscaping. Alternate pricing for 3500 gallon grease trap. Thanks for your question. You should consult with RSMeans directly for detailed information on GSF data across the country. They are the developers of the information we’re presenting here and have considerably more in-depth and always up-to-date analysis. They are at rsmeans.com. My system is for steel frame and reinforced concrete floors/ceilings. I would like to know what to expect in the Major US cities as well as Canada, Mexico and south of there. Dean, do you have a breakdown of GSF costs for mid (12 to 40 stories) and high rise office or condos per US city? I have been trying to research and call people but its tough to get a real handle on it. Looks like 350 to 650 in NY up to 1250 for 1 World Trade, and 10 to 20 percent less in LA. I have a new building system that can save a company up to 40% of construction costs but I’ve got to have a basis for discussion. Any Ideas on where to get the data? Cost estimate would be over a decade old at this point, certainly needs to be re-visited. We would be happy to help with architecture or any of the engineering disciplines as well when this project moves forward. We are a full service Architecture firm with our own in-house structural, Civil and MEP engineers. We have licensure across North America and are well suited for projects like this. I am curious though, if there was originally an architect involved in this project, why didn’t he prepare a cost estimate for you? That is typical (and necessary) for that scope. Of Course. The RSMeans data is for new construction. If the building is existing, then there are many more complexities in determining the costs. What will be replaced, what is existing…Building skin, mechanical and electrical systems, structural changes, major architectural components? All of these things can only be vetted out in a proper line item budget as there is no index for a price per square foot with so many variables. By the way Dean, this is an existing structure. does that bring the costs down on your white box numbers? We are considering a design team out of Jacksonville, FL, as well as the original architect (project stalled) and would welcome another viewpoint if we decide to continue. Geo, a bit more information would help to inform the project. “White Box” finishes vary, but generally indicate that while there is no declared tenant, little to no remodel work would need to be done upon move-in. With that said, the RSMeans chart would tell us between $150-$170 per square foot would be the ballpark place to start. Let me know if you are working with a design team as we would be happy to discuss this project with you further. Thanks! We’re looking at an 20-floor 350,000 sq. ft. concrete shell with glass curtaining in the Tampa area. What would be a BP sq. ft. estimate to white-box the building for class-a tenancy? Plans call for 12-elevators. Can you tell me where the project(s) are located? 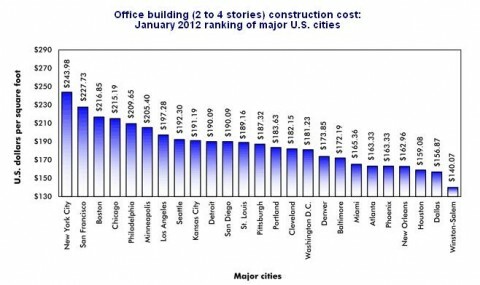 As you can see by the article, construction cost per square foot is heavily influenced by location. Let me know and we’d be happy to help. We have a great deal of experience in both banks as well as multifamily projects, so we should be able to provide some very relevant data on that. Thanks!